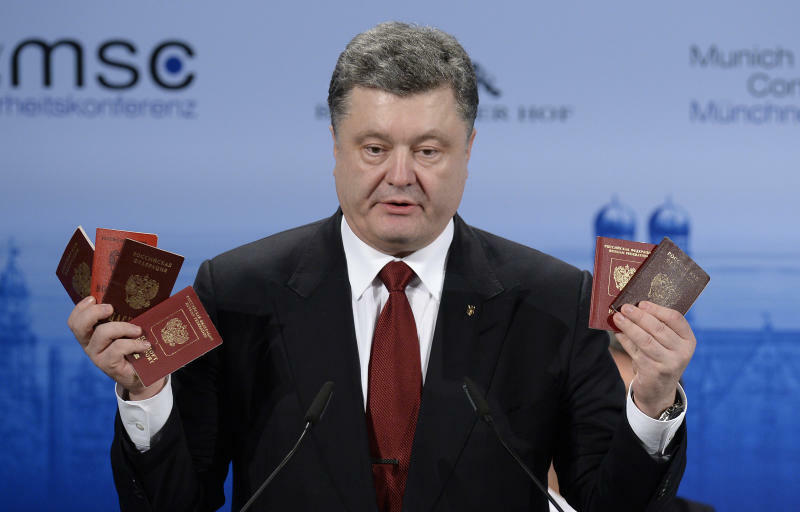 Munich (Germany) (AFP) - Ukraine President Petro Poroshenko Saturday brandished in front of world leaders several passports taken from Russian soldiers in what he said was proof of Moscow's "presence" in his country. "I take with me the passports and military ID of Russian soldiers, Russian officers who come to us," Poroshenko said, dramatically waving two handfuls of at least seven documents. "This is the best evidence for the aggression and for the presence of Russian troops," he told the Munich Security Conference, speaking in English. "How much evidence does the world still need to recognise the obvious fact there is a foreign military" within Ukraine's sovereign territory, he asked. "Our neighbour has breached international law and annexed part of our territory. Today a former strategic partner is waging a hidden war against a sovereign state." Poroshenko charged that "mountains of lies and propaganda have been heaped (onto) the wall of hatred erected between two once very friendly nations". The border was now "swarming with Russian tanks, armed personnel carriers, multiple rocket launchers and ammunition," he said.